I wouldn’t say I disliked whisky but it definitely isn’t my ‘thing’. A couple of friends have tried to get me into ‘the good stuff’ but I’ve always resisted. I don’t really need another expensive hobby. I’ve flown to Belgium specifically to drink beer that’s been ageing in dusty cellars for 20 years. Paid the equivalent of £50 a pint for a rare and exclusive beer. Will happily spend good money on wine in a fancy restaurant and have a growing collection of craft gin. But I’ve just never felt the same attraction to whisky. 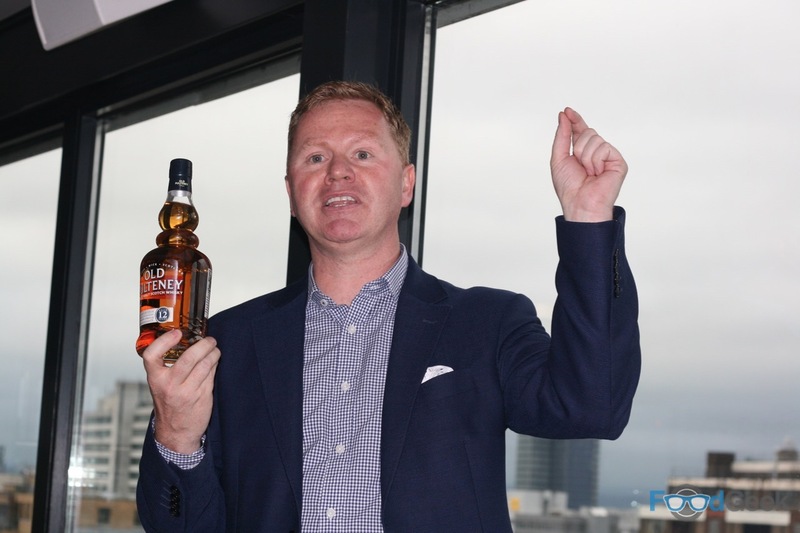 So when I was invited to a whisky tasting event I was reluctant at first. It helped that it was run by Old Pulteney though. As although I’d never tried any I was aware of their excellent reputation. Also that it was a food and whisky pairing event. Pairing food and drink is something I’m passionate about. Usually beer or wine but I was keen to broaden my knowledge. Oh, and it didn’t hurt that it was to held at Manchester House, with dishes created by top chef Aiden Byrne either. 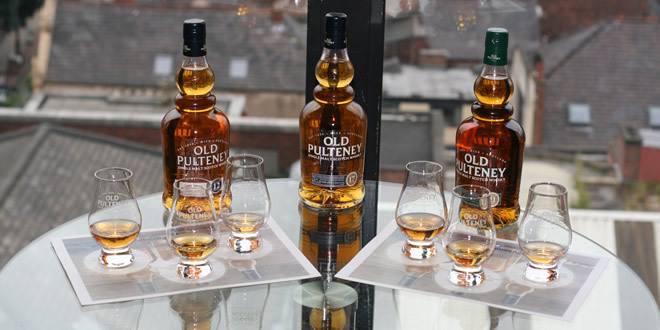 I got to sample three different versions of Old Pulteney whisky. 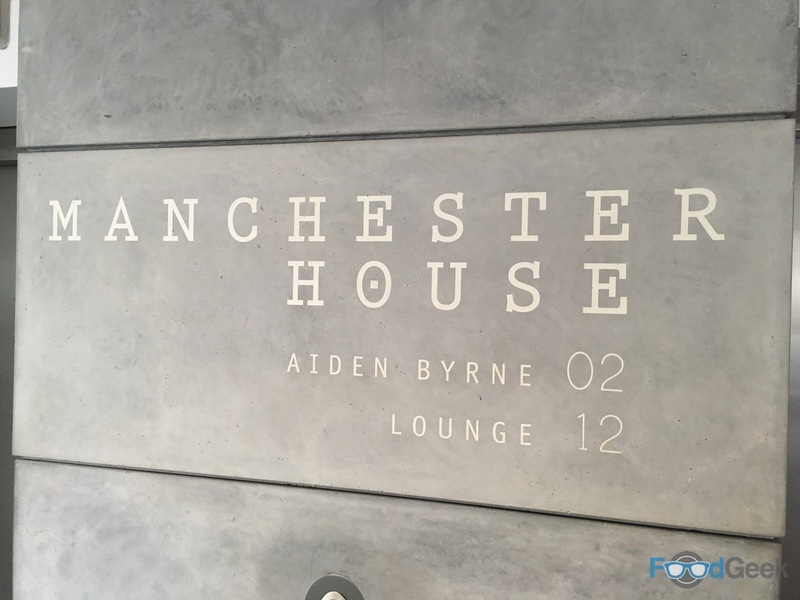 With stunning views overlooking for city from Manchester House’s 12th-floor bar. We kicked things off with a twist on classic whisky cocktail the ‘Rusty Nail’. Two parts Old Pulteney 12 Year Old, one part Old Pulteney Stroma Malt Whisky Liqueur and a dash of orange bitters. Not a cocktail I would have ordered but I thoroughly enjoyed it. Whilst it was clearly very strong it belied its ABV and was far too easy to drink. Smooth, sweet and warming. Fruity and spicy with honey and toffee notes coming through. 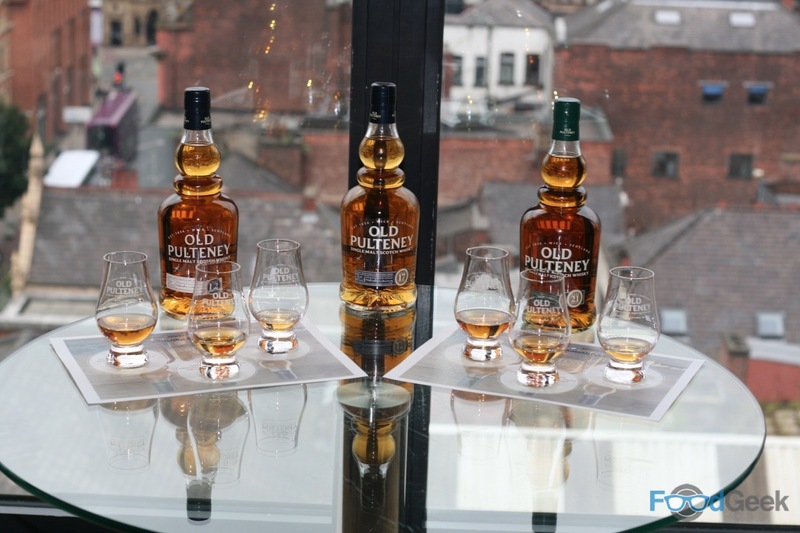 Then it was time for a bit of background on Old Pulteney from ‘Senior Brand Manager’ Andy Hannah. 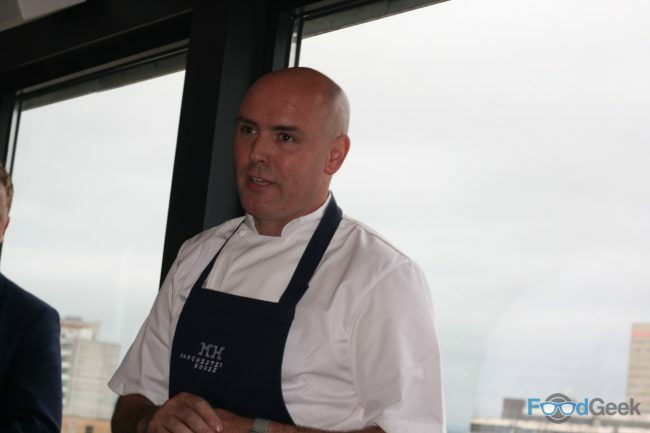 He spoke passionately about the company, its history, heritage and successes over the years. 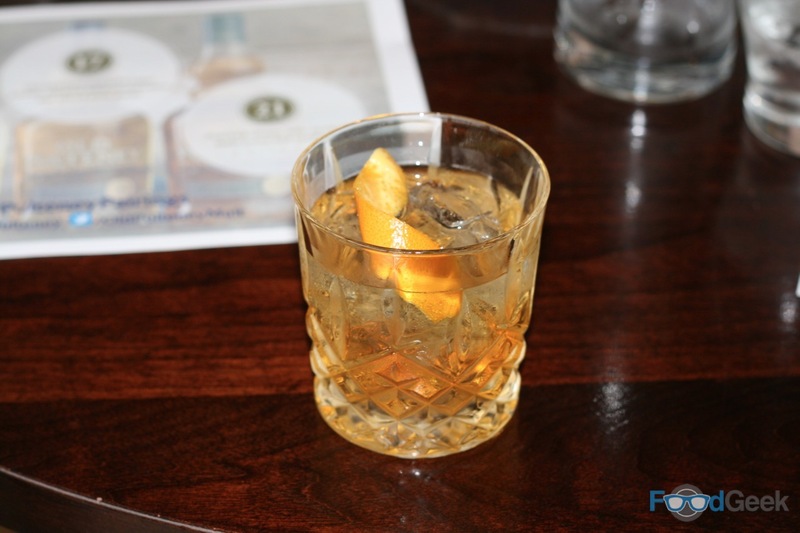 He then introduced the first whisky we’d be tasting, Old Pulteney 12 Year Old. I’d never seen such a bright, golden colour of whisky. It tasted lighter than any I’ve had before as well. Quite dry, citrusy, lemony with a bit of honey sweetness and ever so slightly salty. 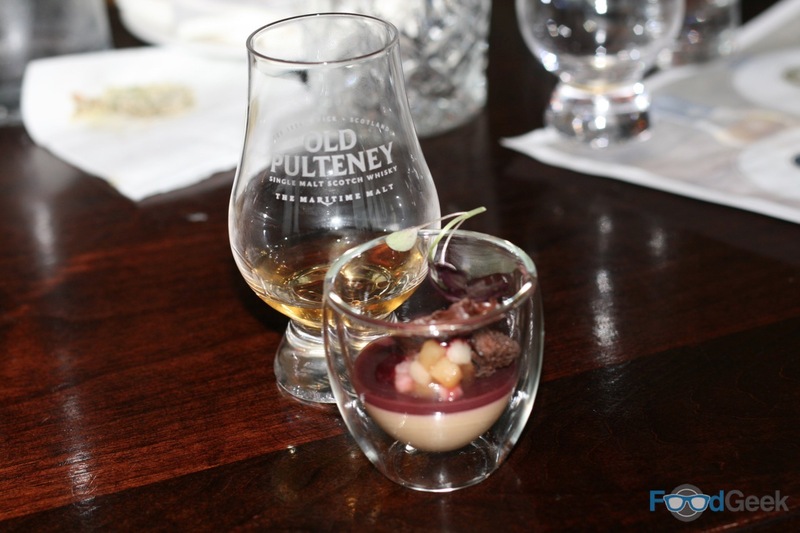 Aiden introduced the three canapés he’d created specifically to complement each whisky. Starting with ‘Nori Rice Cracker with Cured Salmon’. As a fan of Japanese food, this was my kind of dish. 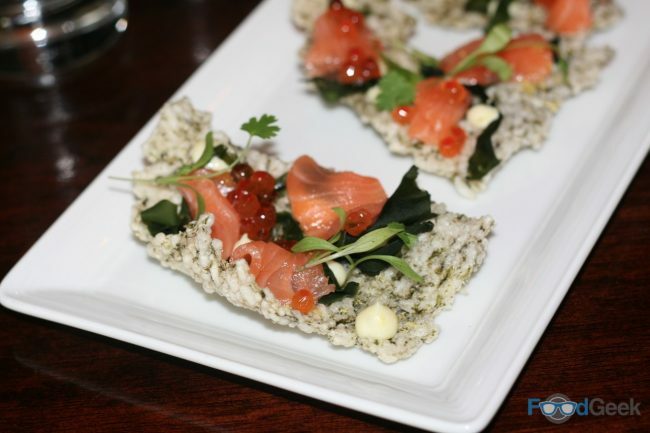 Crunchy seaweed cracker topped with fresh seaweed, beautiful smoked salmon, delicate salmon caviar and a punchy wasabi mayo. It was a taste sensation. Both the dish by itself and even more so when paired with the whisky. The flavours of the sea really brought out the salt in the whisky. While the citrus notes cut through the richness of the fatty salmon perfectly. 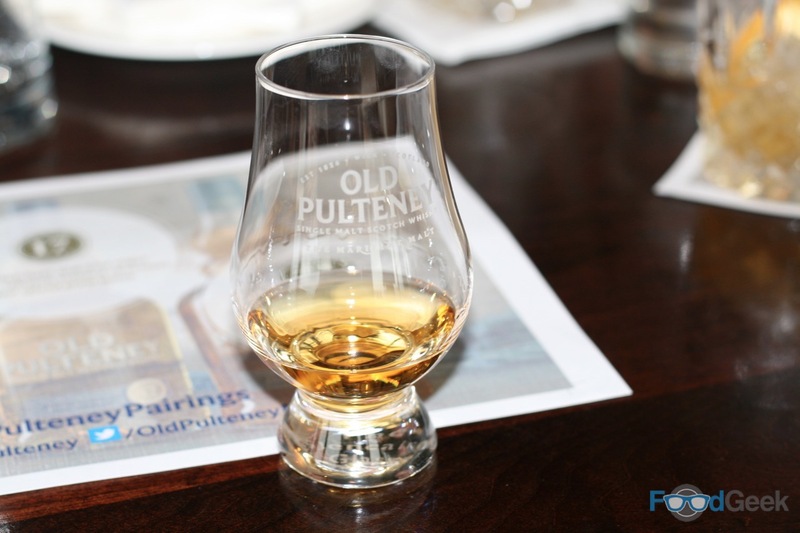 Next up was my favourite of the trio, 17-year aged Old Pulteney. A darker colour with a fuller flavour, more depth and richness to match. Complex and intense – with spicy, peppery and fruity flavours – yet somehow even more drinkable than the last. Aiden’s paring was an interesting choice. ‘Chicken liver and wild sugar parfait’, with tobacco scented aerated chocolate and spiced plum puree. An intriguing dish that worked well with the whisky. Both shared a similar fruitness. While the tobacco-scented chocolate melded with the spicy peppery flavours. The final whisky was the very special and multiple award winning Old Pulteney 21 Year Old. Aged in former bourbon and sherry American oak casks. This was undoubtedly a more challenging drink but it also felt the most elegant and sophisticated. There was some fruitiness, green apple perhaps, a slight smokiness and a touch of vanilla from the bourbon casks. It was served with my favourite dish, ‘Poached Lobster’. Only a mouthful but one that delivered so many flavours. 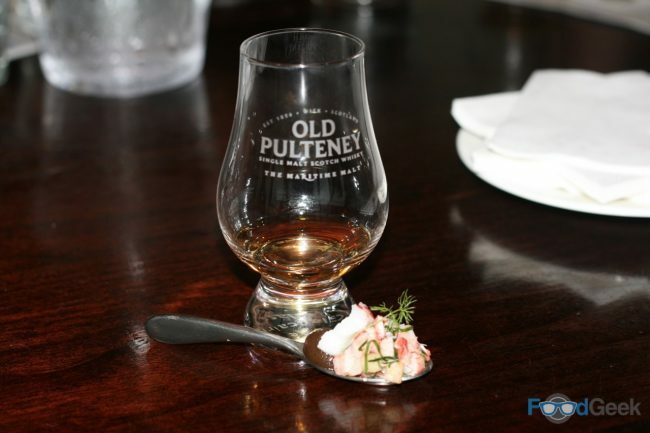 The natural sweetness of lobster, along with the sharpness and smoke of smoked apple puree and a drop of vanilla oil connected with the similar flavours of the whisky wonderfully. I really enjoyed the evening. Aiden’s food was, as ever, stunning and I liked the three whiskies, much more than I thought I would. While I can’t say I was instantly converted into the world’s biggest whisky fan, it certainly opened my eyes to the different flavour profiles available. I’m seeing a whole new world of pairing possibilities. 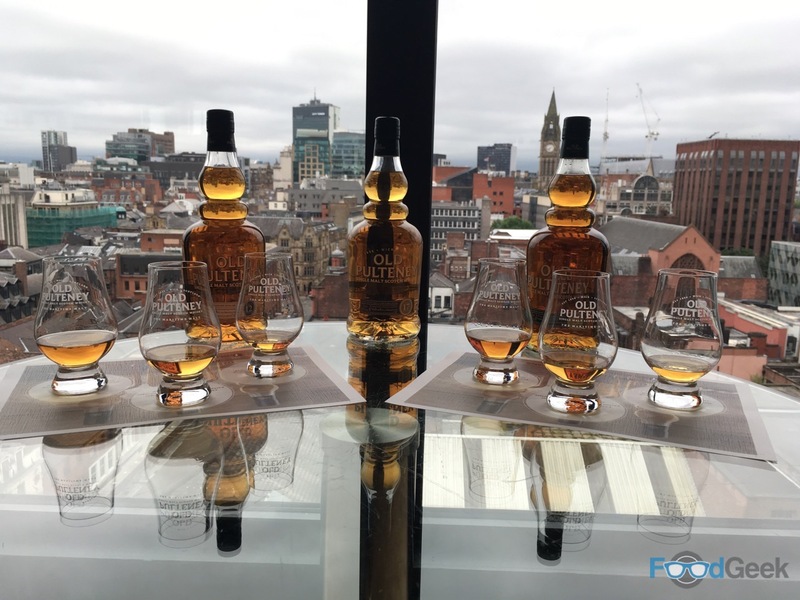 This event was held in advance of Aiden and Old Pulteney appearing at the Bolton Food and Drink Festival. Which starts today (Friday 26th August) and runs until the 29th August. 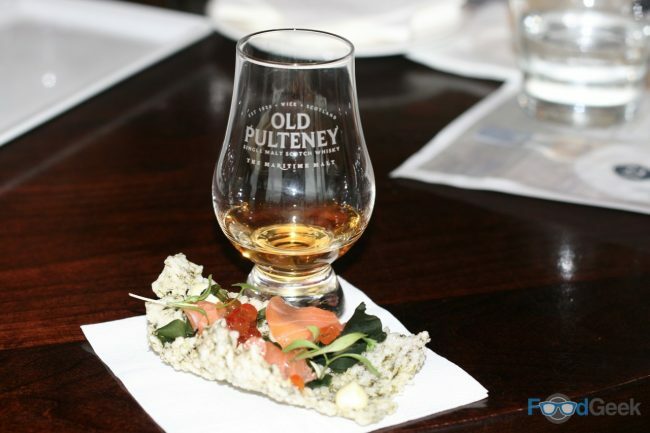 Old Pulteney are a major sponsor and will be running a bar made from driftwood. Where you can sample some of these fantastic whiskies. 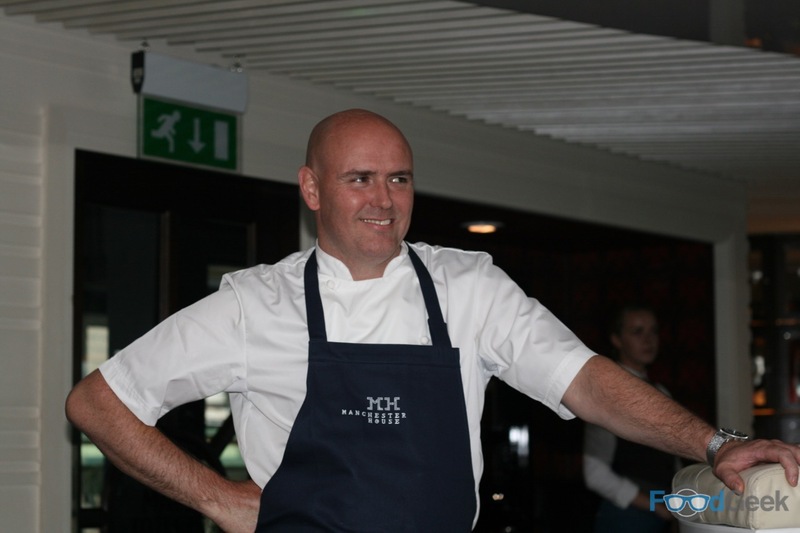 And you can watch Aiden perform two cooking demos at The Chef’s Quarter in The Vaults, or eat his food at the Gala Dinner tonight. Disclaimer: This was an invite only event. But as you know by now, plying me with free alcohol will not guarantee a review, let alone a positive one.